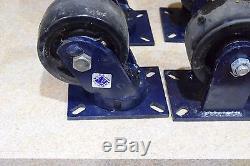 This listing is for (4) RWM casters. 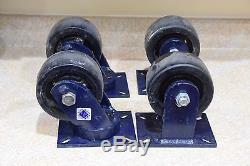 These are super heavy duty and each weigh at least 40 pounds each if not more. These are equipped with 6 inch by 3 inch wheels. 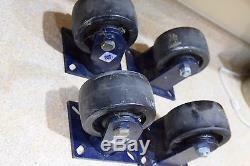 These casters do show general wear as pictured but are fully functional. Please refer to the pictures for any further details on the item as well as condition and I will gladly answer any questions. If for any reason a product is not one hundred percent functional, all discrepancies will clearly be outlined. 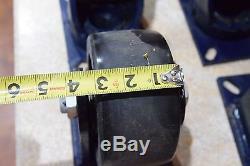 As always I try to give as many pictures for determining the condition of the item being listed. I try my best to give an unbiased and honest opinion of the item being listed. If for any reason it seems there is an issue with the listing then please do not hesitate to ask. Sometimes my descriptions may be brief, but I put most of my time and effort in providing numerous high quality images of the item being listed. If you have any questions dont hesitate to ask and i get back with an answer as fast as i can. As a general rule, I will not accept any offers 20 percent below my asking price. No exceptions so please don't ask. 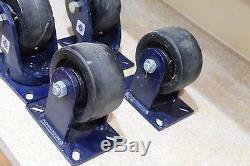 The item "Set Of (4) RWM Casters 75 Series Super Heavy Duty Forged Steel Wheel, 5000" is in sale since Wednesday, June 14, 2017. 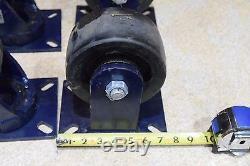 This item is in the category "Business & Industrial\Material Handling\Casters & Wheels\Caster Accessories & Hardware". The seller is "buyandsellspringfield" and is located in Springfield, Ohio. This item can be shipped to United States, Canada, United Kingdom, Denmark, Romania, Slovakia, Bulgaria, Czech republic, Finland, Hungary, Latvia, Lithuania, Malta, Estonia, Australia, Greece, Portugal, Cyprus, Slovenia, Japan, China, Sweden, South Korea, Indonesia, Taiwan, Thailand, Belgium, France, Hong Kong, Ireland, Netherlands, Poland, Spain, Italy, Germany, Austria, Russian federation, Israel, Mexico, New Zealand, Singapore, Switzerland, Norway, Saudi arabia, Ukraine, United arab emirates, Qatar, Kuwait, Bahrain, Croatia, Malaysia, Chile, Colombia, Costa rica, Panama, Trinidad and tobago, Guatemala, Honduras, Jamaica, Barbados, Bangladesh, Bermuda, Brunei darussalam, Bolivia, Ecuador, Egypt, French guiana, Guernsey, Gibraltar, Guadeloupe, Iceland, Jersey, Jordan, Cambodia, Cayman islands, Liechtenstein, Sri lanka, Luxembourg, Monaco, Macao, Martinique, Maldives, Nicaragua, Oman, Pakistan, Paraguay, Reunion.